We've been on a pixie hunt, Henry (my ginger cat) and I. Hoping to find a pixie nest we were sorely disappointed in our quest, although we did happen across a new pixie friend. Maybe next time we will discover where these tricky little blue cuties hide themselves when they are not causing mischievous mayhem or playful pranks. Because despite their unruly reputation as terrible little troublemakers, I just love the idea of a home filled with a gang of gorgeously clever Cornish pixies. In Part 1 of my introduction to these beautifully designed Cornish Pixies, I compared the original pattern (here seen on the left) to the updated pattern but printed at a reduced size, that is 85% (here seen on the right). The middle pixie in this photo is made from the updated pattern printed at its correct size. As you can see the updated pattern produces a taller pixie then the original pattern. The original pattern produces a 9 inch tall pixie, whereas the updated pattern produces a pixie that is 10 inches tall, leaving its reduced sized pattern to produce an 8 inch tall pixie as described in the Harry Potter series. Side by side it is easier to highlight the similarities and differences between the two patterns. For the most part however these two patterns are much the same, the only real difference being the leg pattern pieces that have been modified in the updated pattern, as have the wings but more about that later. Both patterns provide the same options for either a single coloured or two tone coloured pixie so I have created one of each for comparison. Both I think are lovely, so I guess it comes down to personal taste, or the amount of fabric you have. 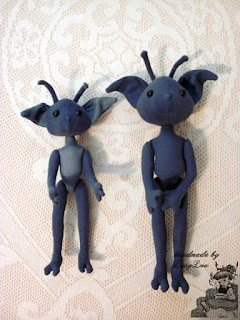 As mentioned above, these two pixies are from the same pattern, only one is made at a reduced size. They have the same size eyes, as 10mm safety eyes are the only size eyes I have. 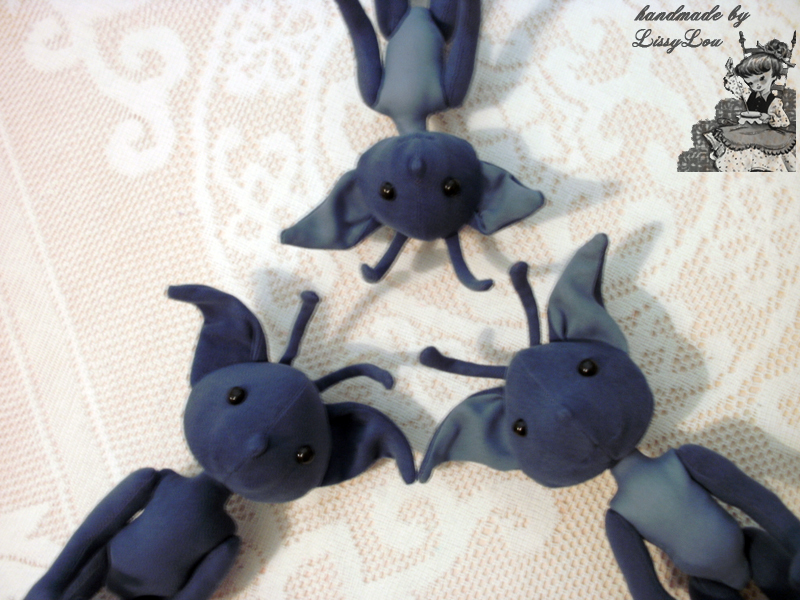 They also have the same size antennae as I found the antennae a little tricky to turn once sewn, the tutorial has a great tip for this. Because I thought the reduced size antennae would be too difficult for me to turn I used the standard pattern piece antennae, only I shortened the length a little for the reduced size pixie. I love the different looks you get with the different sizes and one could always experiment with different size eyes, or eye colours. As a hand-sewer it does take longer to complete a project then it would if using a machine, but the longer I sit with a project the more proud I am of how it turns out, imperfections and all. I have found that you can hand-sew just about anything that can be done by machine, you just need a lot more time and the patience to go with it. 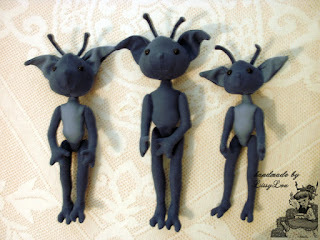 As with the Garden Gnomes, these pixies were sewn together in pretty much the same way. 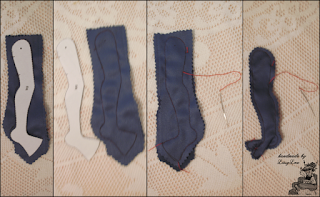 Ignoring the seam allowance I cut-out the pattern pieces following the sewing line then traced the pieces to the fabric. I then cut the fabric pieces to be sewn together. I used a double stand of thread and a running stitch to sew the pieces together, however you could use a backstitch or whatever other stitch you are comfortable with. It is just a mater of following along with the tutorial but stitching by hand in place of a machine. 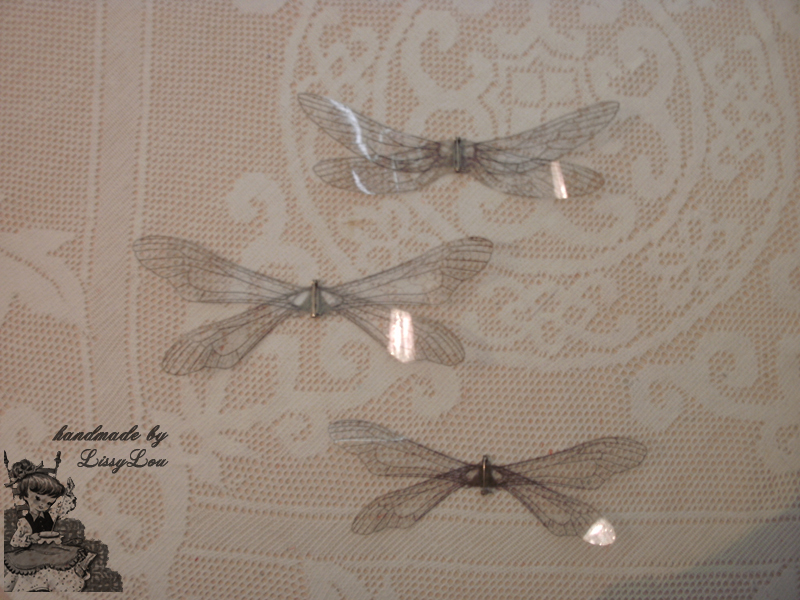 The patterns for the wings included with these pixies are so beautiful. 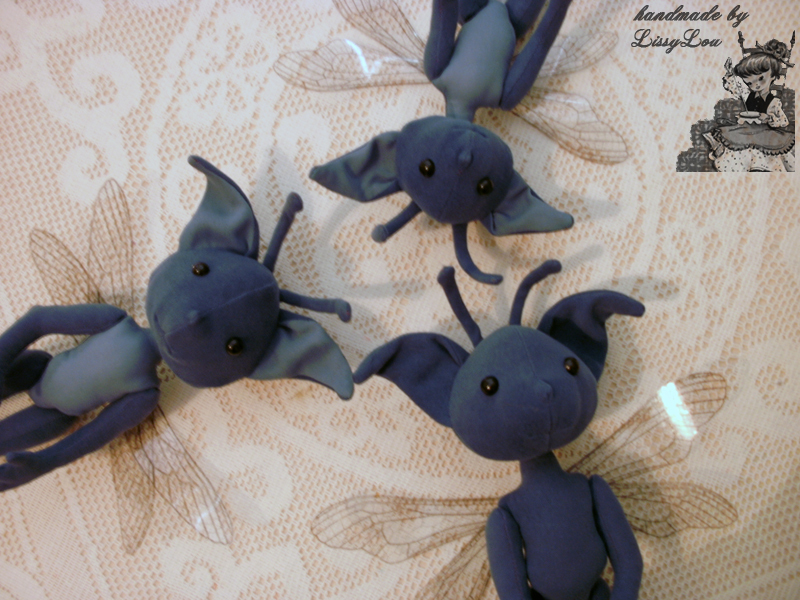 There are two different designs for these, the wings at the top of this picture are from the original pixie pattern, the middle wings are those from the updated pattern and the bottom wings are from the updated pattern but at a reduced size. I wont give-away how these were made as the tutorial has great instructions for making these but I will say they are cleverly designed to be removable using pinbacks. So you can have wingless Cornish Pixies like those described in the Harry Potter books or you can have the option with wings like those seen in the Harry Potter movies. No wizarding home would be complete without its own pack of Cornish Pixies. 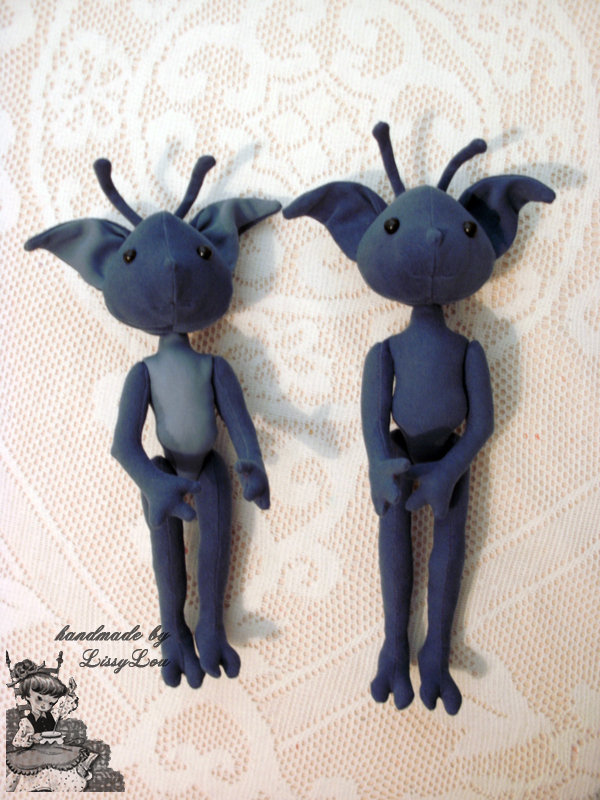 They are additively fun to make and honestly you can never have too many Cornish Pixies fluttering about. I do recommend that for those not so experienced with sewing that you attempt one of the regular sized pixies before making a reduced sized one if a smaller one is desired, just to get used to the pattern as the reduced size pixie can be a little fiddly in places. As mentioned previously Tiffany Hinnen (aka. Mieljolie) designed these pixies and you can find her on her blog All Things Crafty, or purchase this pattern on her etsy store HERE.